You are here: Home / CRICUT PROJECTS / Make Your Own Coffee Sign! Hi Guys! Today I’m going to share a project I recently made for my cousin using my favorite crafting tool, my Cricut Explore. I use it to make all the stencils for my hand painted signs. But that’s just one of the zillions of things you can make with it and their brand new machine, the CRICUT MAKER –that cuts just about anything from paper, to lightweight wood, cardstock, vinyl, fabric and so much more! This machine is incredible and just makes things so much easier, faster and more professional looking. 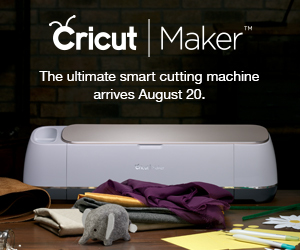 This is the NEW Cricut Maker–you have to check it out!!!! My cousin Susan recently sent me a photo of a “Coffeeology” type sign and asked if I could make one for her kitchen. I checked a few out on Pinterest to see what they looked like and, since I didn’t want to copy someone else’s work, I did a quick search of “coffee phrases”. I chose my favorites and got to work in Cricut Design Space! I designed and cut an adhesive stencil using the Cricut Explore. My sign measures 11 ” x 22″ and, in this case, is cut from MDF (medium density fiberboard) with two grooves (optional) cut into it to make it appear more like painted pallet wood. I have used pallet wood in the past and love the way it looks, but sometimes it’s a little hard to find nice, straight boards so MDF is a great alternative. It’s so easy to use Cricut Design space. Simply type in your words, chose the fonts, add a cute graphic, insert the adhesive backed stencil material into the machine and press cut! You can save your projects so you can make more without repeating the design process! Cricut also has tons of “ready to make” projects pre-loaded into design space to choose from. There are plenty of other ways to make signs without using a Cricut Explore–regular stencils , the printer-pencil tracing method, etc. I have found that adhesive stencils and the Cricut save a ton of time and work best. Design your stencil layout. This can be done on your Cricut Explore in Cricut Design Space, or you can use a purchased stencil ! I chose eight different sayings and a mug of coffee. My cousin and I love to “Sip & Flip” which is drinking coffee while thumbing through decorating and craft magazines, so I had to add it to the mug. I typed my phrases, chose my fonts, centered it all up, sized it to fit the wood and cut the stencil. The next step is weeding, which simply means pulling the letters off of the backing. Once finished weeding, apply transfer tape to the project. Transfer tape is the blue grid, clear tape that is used to stabilize the stencil so the backing can be peeled off to apply to the board without the project losing its shape by stretching. FYI: sorry for the bad lighting–rain for days means bad lighting! Prepare your sign board. Whether your using a store bough sign blank or wood you have cut yourself I recommend you lightly sand the surface. Then using tack cloth or a damp rag wipe off any dust. Apply two coats of your background paint (in this case white paint). Apply your stencil by finding your center on the stencil and on your sign and marking them with a pencil. Match up the two marks. Use a small level to make sure your words are straight. Paint your stencil. I chose black for most of the letters, switching it up with brown every now and then to add a little interest. My mug was orange to match the kitchen colors. Allow to dry a couple of minutes and carefully remove the stencil. Make any touch-ups after the paint is dry so you don’t smear the paint. Most of my signs are distressed a bit and occassionally some of the background paint pulls of when I remove the stencil and that’s just fine with me! After completely dry, you can lightly sand your sign to give it a more “distressed” appearance if you would like. Totally optional. Then I use a clear, non-yellowing polycrylic sealer (two coats) and your finished!